Songs of Faith© was compiled and published in 2000 by H. Neal and Claudel B. McKenzie. In 1999, Neal and Claudel realized that their church needed new hymn books. They looked at the church hymn books that were on the market at that time but couldn't find anything that met their desires. The available songbooks did not contain a lot of the hymns they wanted and had many songs that were never sung in the churches with which they were familiar. Most of the churches that they visited used multiple books to try to have the songs they wanted available, but switching among three or four books during a church service was awkward. In addition, there were many old gospel songs that were no longer available in print and were in danger of being forgotten. Out of a desire to meet the needs of their church and to preserve traditional gospel songs, Neal and Claudel decided to create and publish their own hymnal. In 2000, they formed the company Double Oak Press and published Songs of Faith. The book is currently in use by over three thousand churches in north Georgia, western North Carolina, upstate South Carolina, north Alabama, southern Mississippi, southern Louisiana, east Tennessee and parts of Kentucky. 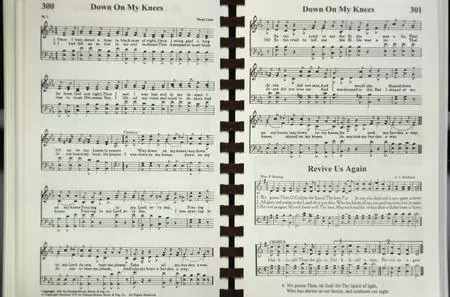 While this songbook is widely used by churches in the southeastern United States, its use has spread as far west as California, as far north as Canada, as far east as New York and as far south as Miami, Florida. Claudel and Neal are grateful for the inspiration to create this hymnal. Hearing songs sung in church that they had feared could be lost forever is a touching experience for them. Neal and Claudel are members of Philadelphia Baptist Church of Christ in Jasper, Georgia. Philadelphia is an old-fashioned country Baptist church with approximately 250 members. It is one of an association of 21 churches in northern Georgia. Each church in the Association usually meets one weekend a month, and members are encouraged to visit and support other churches. Claudel has been a member of Philadelphia since 1958. She is a retired Professor of Accounting who taught at the University of North Carolina at Asheville for 33 years. She served as the the chairperson of the Department of Management and Accountancy 1998-2012. Neal is a Baptist minister, ordained in 1991 at Philadelphia Baptist Church. He is also a retired college professor with a PhD in economics. He taught economics for 32 years and served as the chairperson of the Division of Business Administration and Social Sciences at Dalton College, Dalton, GA 1989-1998.